Welcome to the 2019 Spring Rec Program, in Columbia Falls! 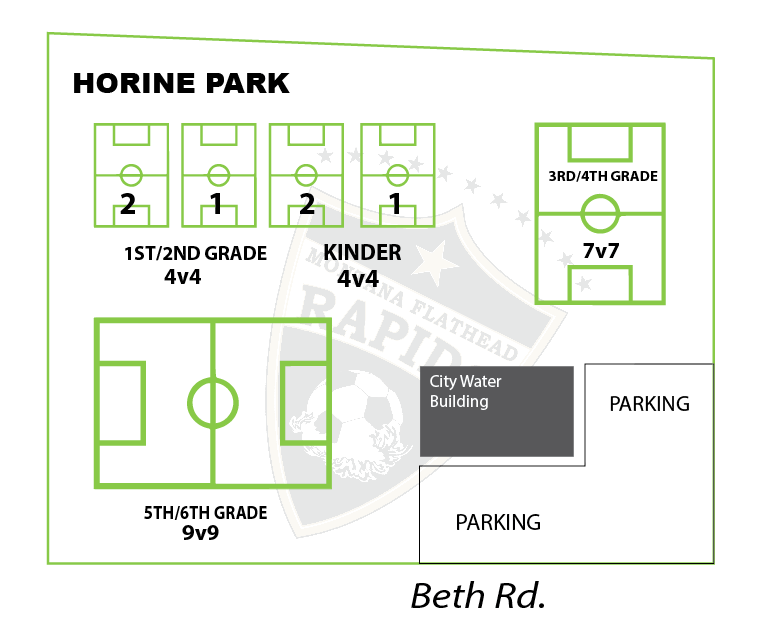 The Flathead Rapids are dedicated to bringing quality youth soccer programs to our local communities. We’re currently sitting at 215+ players registered for the Spring Rec Program, which is 100 more than last year! We’re excited about the growing soccer community in Columbia Falls and we can’t wait to get everyone out playing! Our rec programs are designed to introduce the game of soccer, in a fun and exciting way. Our volunteer coaches are dedicating their time to provide a healthy environment for all of our participants. Coaches are supported with age appropriate practice plans, coaching resources, and guidance from our program directors. Currently, we’re sending rosters to coaches to provide any last minute feedback. Once rosters are set, coaches will be contacting their team to set up first practices. First practices will be scheduled the week of APRIL 15TH. First games are APRIL 20TH! ALL OTHER DETAILS ABOUT THE SEASON IS PROVIDED IN THE INFORMATION BELOW. Our teams/age groups are divided by grade. Yes, this is different than last year. We realize some of you were in an older or younger age group last year, but this is how all our rec programs are run. Rec programs around the valley run by grade to help with carpooling, friends in the same grade, and other family dynamics that help to run a smooth program. Please do not request to move age groups. Scroll down to find your age group. Cleats are recommended at this age. Sometimes players can get away with wearing tennis shoes, but if the ground is wet, which is usually is, the players will be slipping. If you’re not excited about buying new cleats at such a young age, their are thrift stores around the valley, that usually have used equipment. Shinguards are required for practices and games. At this age, players can be pretty inaccurate with their kicks and the shins are usually the casualty. Long soccer socks go over the shinguards to help keep them in place. Since most of the leg is covered with soccer socks, shorts are usually a good option. If you have a soccer ball at home, please bring it to practices. Coaches are provided equipment, but more balls the better! TIME/DAY: Day and time of practices are chosen by your coach. If you have conflicts with their practice time, players are able practice with different teams, upon approval from the coach. They MUST play with their normal teams on Saturday mornings. PRACTICE TIMES WILL BE UPDATED HERE, ONCE OUR TEAMS ARE SET. DURATION: Recommended practice length is 1 hour for this age group. FORMAT: Our volunteer coaches have access to a bunch of coaching resources with activities and games to introduce the game of soccer in a fun and developmentally friendly way. We start a little later for the younger kids, as it’s still pretty cold out. Game schedule will be released once all teams/coaches are finalized. At this age, our goal is to get the player excited about the game, get comfortable with the ball at their feet, and score as many goals as possible. Parents are their to encourage and support. Since most of the leg is covered with soccer socks, shorts are usually a good option. If you have a soccer ball at home, please bring it to practices. Coaches are provided equipment, but more balls the better! TIME/DAY: Day and time of practices are chosen by your coach. If you have conflicts with their time of practice, players are able practice with different teams, upon approval from the coach. They MUST play with their normal teams on Saturday mornings. PRACTICE TIMES WILL BE UPDATED HERE, ONCE OUR TEAMS ARE SET. Cleats are required at this age. If you’re not excited about buying new cleats, there’re thrift stores around the valley, that usually have used equipment. Shinguards are required for practices and games. TIME/DAY: Day and time of practices are chosen by your coach. DURATION: Recommended practice length is 1.5 hour for this age group. FORMAT: Our volunteer coaches have access to our Rapids Coaching Corner, with hundreds of age appropriate practice plans, meant to not only develop the player, but to help become a better coach. Both Kalispell and Bigfork end their season before Memorial Day (March 25th), so we don’t have an option to play them, but we’d like to give our players a few more weeks of the season, if families and coaches are willing and able. At this point, the schedule is TBD after May 18th. Have a question about our programs? We’re quick to get back to you by email…just send us a note.